You can see some amazing things when you’re crusing through the most remote spots on earth. No one is more aware of this than the team behind EYOS Expeditions, who specialise in taking superyachts to extreme environments in search of adventure. 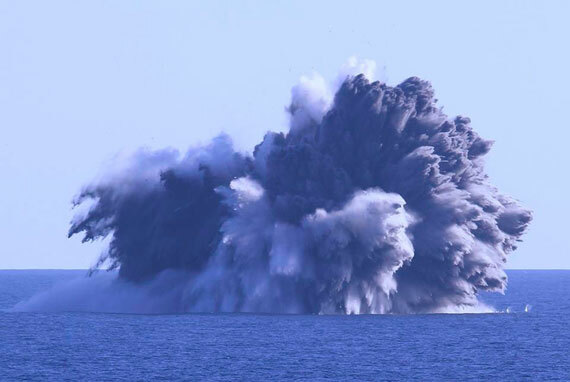 In early June, when the EYOS team were deep in to their 11th journey on board The World (the largest privately owned, residential yacht on earth) they happened upon an underwater volcanic eruption. This expedition was to cover a broad section of Melanesia, focusing on some of the most remote locations in the Solomon Islands while exploring parts of Papua New Guinea. On board was a team of 14 expedition staff, including historians, cultural anthropologists, ornithologists, marine biologists, kayak guides, and divemasters. Upon sailing south from Gizo towards Santa Anna, Captain Johan Dyrnes and expedition leader Rob McCallum decided to see if the submarine volcano Kavachi was active. Kavachi is a stratovolcano with periodic explosive eruptions. It is about 8km in diameter, rises approximately 1,000 metres from the sea floor, and is typically between 20-60 metres under sea level. Since its first recorded eruption in 1939, it has occasionally been active enough to produce islands up to one kilometre in length before the ocean would erode the island away. The planned course took the ship close to the GPS position of the last reported activity. EYOS staff member Richard White, known in part for his extraordinary eyesight and ability to sight birds and polar bears from miles away, spotted on the horizon discolored water and disturbances on the surface. An announcement was made by the Captain and soon the balconies and open decks were crowded with eager residents and guests. As The World approached closer a few large plumes of water broke the surface about once every ten minutes. You can read more on EYOS Expeditions in the next issue of SuperYacht World, which is out on June 25.